This recipe is a very old favorite of mine. It reminds me of my grandmother’s cooking days, and my Sunday’s visits to her, with my mom. 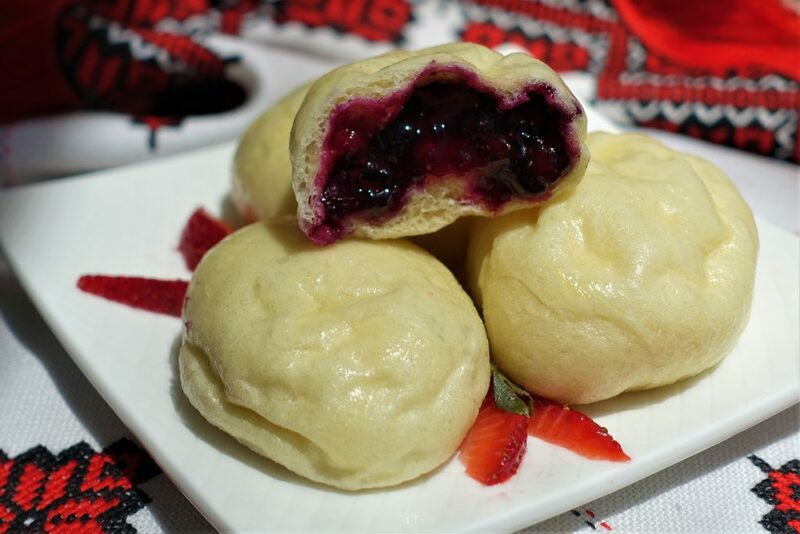 These Steamed Fruit Dumplings (called Perizhky, by my grandma), are much simpler to cook now, than in my grandmother’s days. 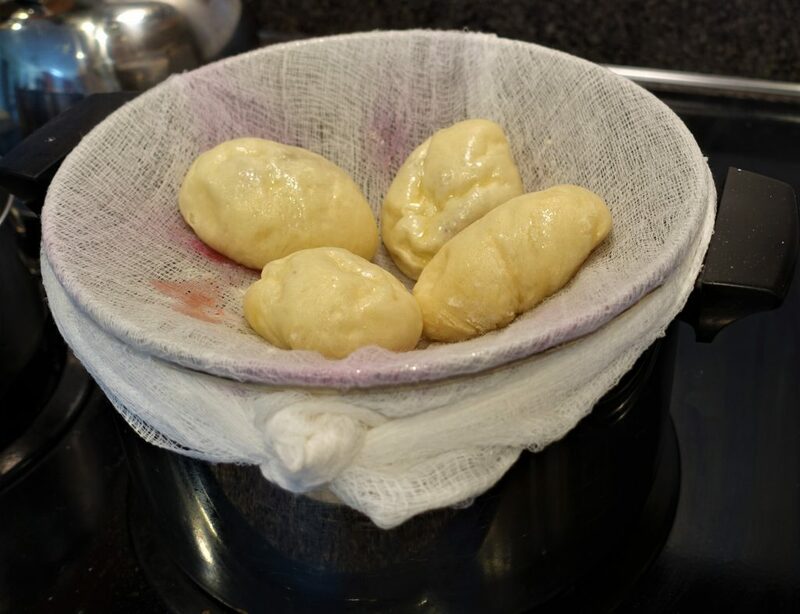 She used cheesecloth tied around a big pot of hot water, and I use my steamer basket lined with a coffee filter. 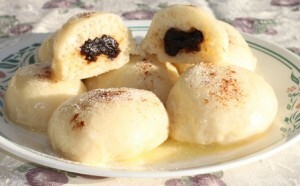 I love these fluffy dumplings, because they are so light in texture, and so delicious, served with melted butter and sugar. This recipe yields about 24 dumplings. A ball of dough, ready to rest. 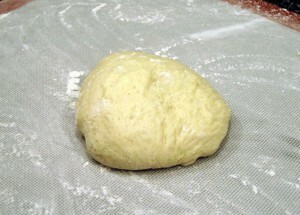 Dough roll about 1.5 inches in diameter and 15-18 inches in length. 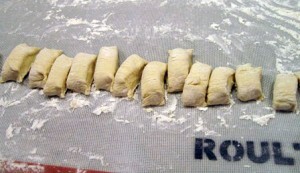 Using a knife, cut the dough roll into 1 1/2 inch pieces. 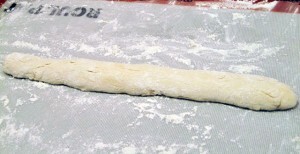 Flatten slightly one piece at a time to form a dough round ready for filling. Filled balls placed on a floured tea towel, ready to rest and rise in a warm place. All risen and ready to steam. Steamer all ready with dumplings for steaming. If you wish, you can also use a large pot covered with double thickness of cheesecloth, fastened around the rim of the pot with a twine, or large rubber band. 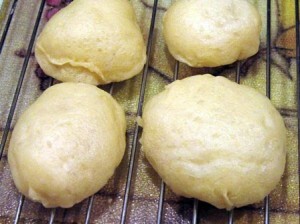 You need to make sure the water does not touch the bottom of the cheesecloth after the dumplings are placed on it. I would suggest not to fill the pot with water more than 1/3 full. Steamed dumplings waiting to cool off. Dissolve the sugar in the lukewarm water. Sprinkle the yeast over the sugar water. Let it stand for 10 minutes, to dissolve. Scald the milk, and cool to lukewarm. Combine the lukewarm milk with the yeast mixture. Add the beaten eggs and salt. 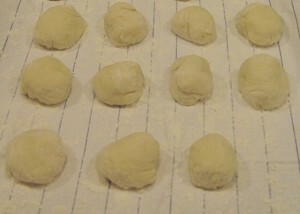 Stir in the flour, and mix by hand for 10-15 minutes to form a soft dough. Cover and let rise in a warm place, until double in bulk (see TIP). Cut the dough in 2 equal parts. On a floured work area, roll one part at a time into a long dough roll, about 1 1/2 inch in diameter and 15-18 inches long. Flatten slightly one piece at a time to form a dough round, ready for filling. Place filling in the middle of the round, and seal edges together. Form a ball, and place on a cookie sheet lined with a floured tea towel. 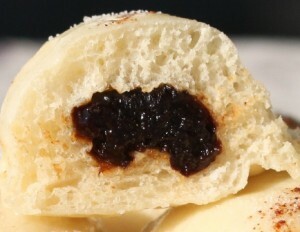 Space the dumpling balls apart, so they to not stick as they rise. 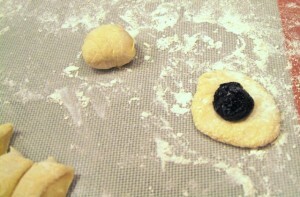 Repeat with the remaining dough pieces, and the remaining half of the dough. Cover with another tea towel, keep in a warm place, until double in bulk. Fill a steamer pot with water, at least 1 inch below the steamer basket. Hang steamer basket over the water, bring to boil. 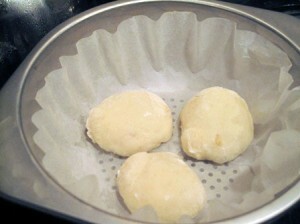 Place a large coffee filter in the steamer basket. Place dumplings in the lined steamer basket, do not crowd them. Cover the pot and continue steaming for 5 minutes. Gently remove dumplings, one at a time, onto a wire rack to cool off. Repeat the process until all dumplings are steamed. These may be served warm with melted butter, then sprinkled with granulated sugar, or with sugar/cinnamon mixture. To speed up the process of rising dough, I use a heating pad, turn it on high to heat it up, then leave it on medium, place the bowl of dough on the pad, cover the top of bowl with saran wrap, then tuck it in with towels around and on top, to keep it warm. Later on, I also place the tray of dumplings on the pad, cover it with a tea towel and keep the pad on warm until all the dumplings are steamed. Thank you so much. You are such a sweetheart!! Busy, must be the nickname for the New Year, for you and me both. I started a new job and am experiencing an “information overload”, but that is to be expected in today’s fast world. Thank you for your valuable time sharing a comment. Oh well, it’s the thought that counts. Maybe next year you will have more luck. I am keeping mine for another year, since now it is a challenge to see how long I can hold on to it, and how well will it thrive. I must say, it is a big responsibility, and an extra chore for busy people. I am so pleased to know that you liked it. My mom used to make these for my children all the time, and they loved them.